YanniG: There is no way for me to travel to the island of Rhodes, thanks to the fcuken troika and the fcuken frau markel and the fcuken 2WD soible with the sick minds that KILL my country's people more and more. So end of life for this lovely cache. This is the most southern part of the island of Rhodes.It is a plastic container hidden at a spot with great view of the two famous beaches. Every kiteboarder or windsurfer in Europe knows this windy spot.Prasonisi is heaven for most of the wind-powered water sports. The plastic container is hidden at the last hill before the beaches, while you head from Kattavia to Prasonisi. The cache consists of the following items: a logbook, a pen and a pencil in a separate ziploc bag, a geocaching declaration in Greek at one side and in English at the opposite side.Also initially contained a small plastic shark, two small candles, a miniature of an F1 car, a resting bunny, a Canadian flag, a fish key holder, four glass balls, an unused fork from a fast food and finally a travel bug (that I found at The Rock cache) that was too big to place it at any other cache in Rhodes ! Please remember not to place inside any flammable items, because the area is full of bushes and the temperatures are pretty high during summer. Warning: At the road from Kattavia to Prasonisi, at some point you will see many strange wide paths into the bushes and some signs written only in Greek.This area is a military area, for tank testing and tank shots.As I saw some caravans parking there for the night, I would like you to have in mind not to enter within these areas with the strange Greek only signs.Unfortunately the military men have not written these signs in English, so the foreigners do not know how dangerous is to park and stay there. The area of the cache is not an army testing area, as there are no signs and also there are no wide trails from the tanks, so you can geocache easily without worries for some missile coming your way ! ! ! Additionally hint: You can leave the asphalt road from Kattavia to Prasonisi at the point N35 53 884 E27 46 476 but you have to be extra careful while you turn to the gravel road, because the level of the asphalt is higher than the gravel road and extra driving skills are needed there.If you think you don’t have them, you can park your car somewhere near and hike to the cache, it is not far away. Enjoy the view from the spot and after logging it, head to the east beach and dive to the crystal clear waters.If you are a kiteboarder or a windsurfer, you will probably set your kite or rig and have fun with the wind! 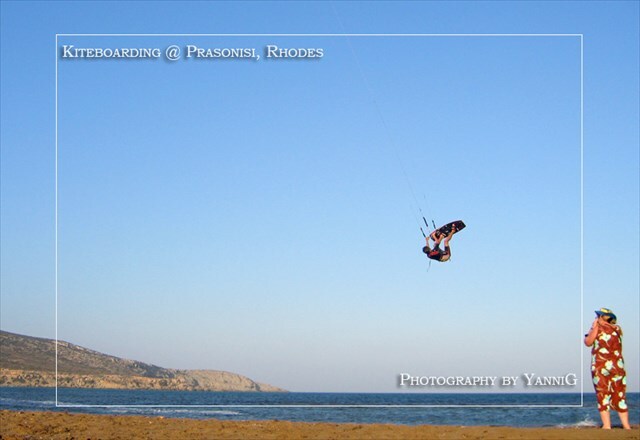 Prasonisi_kiteboarding.jpgKiteboard action at the east beach. Prasonisi_pano_cache.jpgPanoramic view of the two beaches.